A 720° review to explore how well your leaders inspire employee engagement and obtain results—plus how these skills evolve over time. This assessment helps leaders explore their mindfulness and understand how they inspire engagement, work collaboratively and attain success. 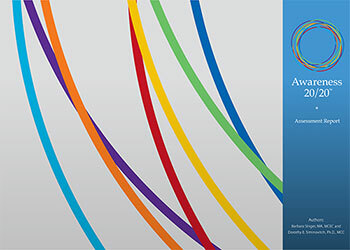 Rooted in the science behind the study of predictors of success and mindfulness, we encourage participants to evaluate their current and desired levels in seven dimensions of awareness. The 720° approach ensures valuable feedback can be incorporated into a person’s behavior over time. Most of us are familiar with traditional 360° survey feedback where you get input from people who know you well professionally once. The 720° approach means you take the assessment twice over a period time (usually 6 months to a year). You can track your growth and have clear data about how others see you improving. Your organization depends on the leadership of talented and ever-evolving individuals and teams. Developing your personal leadership capabilities or those of your students or employees requires accurate self-awareness and personalized plans to build on strengths and improve weaknesses. 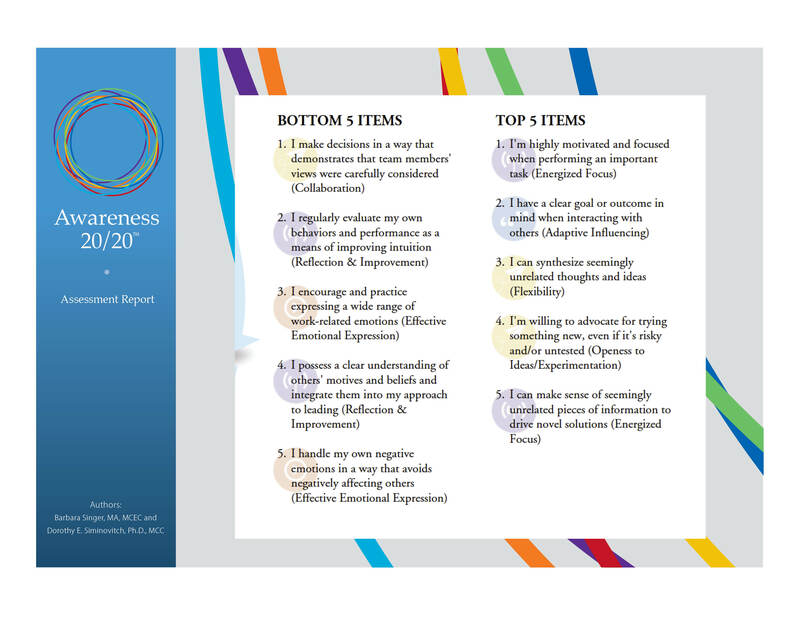 Awareness 20/20™ provides a 720° review of seven dimensions of leadership awareness. Feedback from the initial assessment drives a plan for development, with optional coaching provided by our expert consultants. A second assessment, completed after six months, evaluates the participant’s progress. This assessment is designed for directors and above. It was validated with a global population across a balanced representation of industry sectors, government, and non-profit organizations. Awareness is the ability to perceive, to feel, or to be conscious of events, objects, thoughts, emotions, or sensory patterns. Much needs to be done to help leaders explore their level of decision making in order to succeed. Putting additional science behind the study of mindfulness, this leadership awareness assessment is an accurate measure for presence and use of self. Use this assessment to explore how well a person inspires employee engagement and gets results. The Awareness 20/20™ helps to distill complex ideas into a clear plan of action by combining external feedback from others. Normally unrelated thoughts, ideas, and actions are synthesized by the collaborative review process into related ideas and usable information. Sharing information and resources openly and graciously in order to prepare others to face the unknown. Operating with an entrepreneurial mindset to make decisions as if they were the “owner” of the business. Belonging to groups in a way that energizes others to be optimistic, hopeful, and resilient. It has healthy concern for others as well as self, believing all people have value. The assessment works to surface the hidden biases of the participant, as well as illuminate the hidden biases of others when it comes to stereotyping certain groups of people. Other assessments may take a 360° review approach to evaluating an individual’s self-awareness. But for learnings to be truly useful, they must result in actual change. 720° feedback allows a leader to see him or herself over time. The process begins with 360° of feedback gathered from a supervising leader, direct reports, colleagues, and others (customers, suppliers, volunteers, other professional relationships). This first assessment (360°) is useful for setting a baseline and identifying clear leadership growth goals. Later, in six months to a year, the feedback can be collected again (720°) to measure progress and success in meeting specified goals. Thus, this 720° approach offers a “before and after” look at the seven areas of self-awareness. See the difference each participant’s personal growth and coaching plan makes down the road. Takes action with appropriate urgency yet refrains from acting impulsively. Sees complete environment and long-term implications of a situation in order to react to the higher good. Creates a sense of alignment (between oneself and stakeholders) by sharing meaningful stories and examples. Helps others make sense of a situation. Displays a can-do attitude to try something new. Enjoys tackling novel and/or difficult issues and consistently maintains self-confidence and personal efficacy. Conveys positive contagious energy about ideas or new projects and people. Invites balanced participation to explore multiple ways of achieving an end goal and foster commitment to the decision-making process. Follows ideas through to completion, even in the face of adversity. Executive Core, with more than 150 renowned talent management professionals located all over the globe, works as a strategic partner with large organizations to transform current and future executives’ leadership, communication, productivity and operational skills. Whether working within your existing talent development model or customizing programs for specific challenges, we focus on meeting your business objectives. Executive Core guides your key talent through every stage of the talent management process – development and implementation of Talent Management Strategy, Executive Education, Executive Coaching, Team Building, Enterprise Education and Assessment. We measure progress and refine curriculum to ensure individual and team success. IMPORTANT: After your purchase, you will receive an immediate confirmation email of your purchase and, later, an email from our team to get the process started. Allow up to two business days for this contact. Please check spam and junk mail folders if you experience a delay beyond that timeframe.